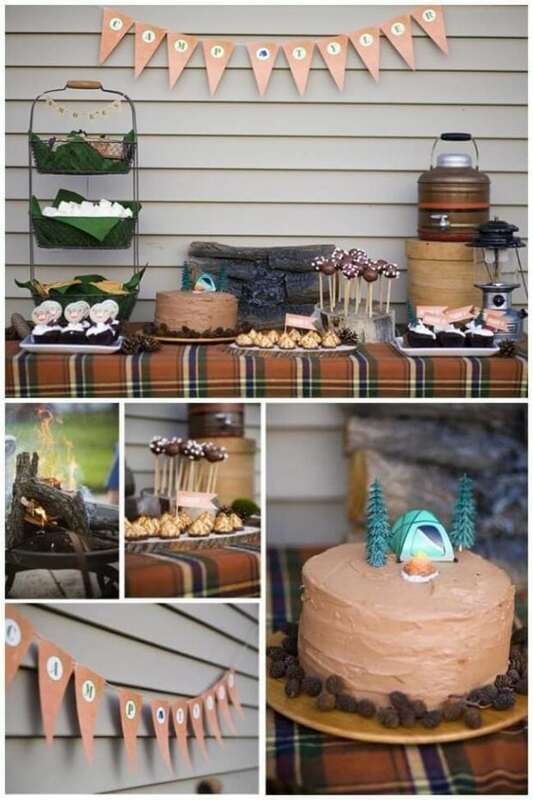 A camping themed birthday party lends itself to so many fun outdoor-inspired designs, so we’ve rounded up 23 awesome camping party ideas for you to check out. There are a ton of clever camping ideas! 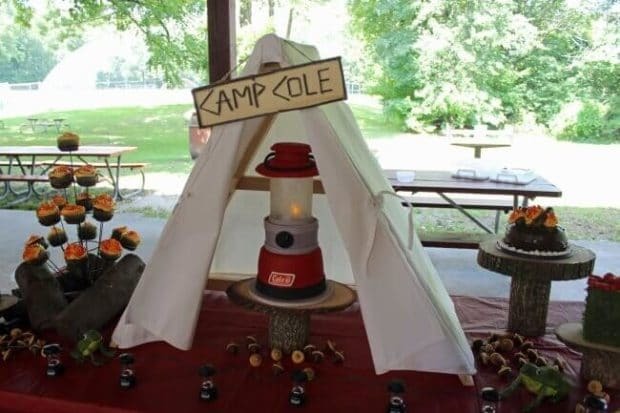 We especially love the creative Coleman lantern cake, build-your-own trail mix bar and yummy s’more party favors. 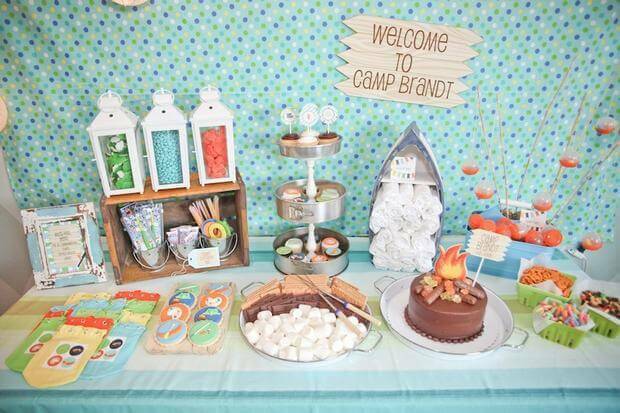 Plan an extraordinary party with ideas from this Boy’s Modern Camping Birthday Party. 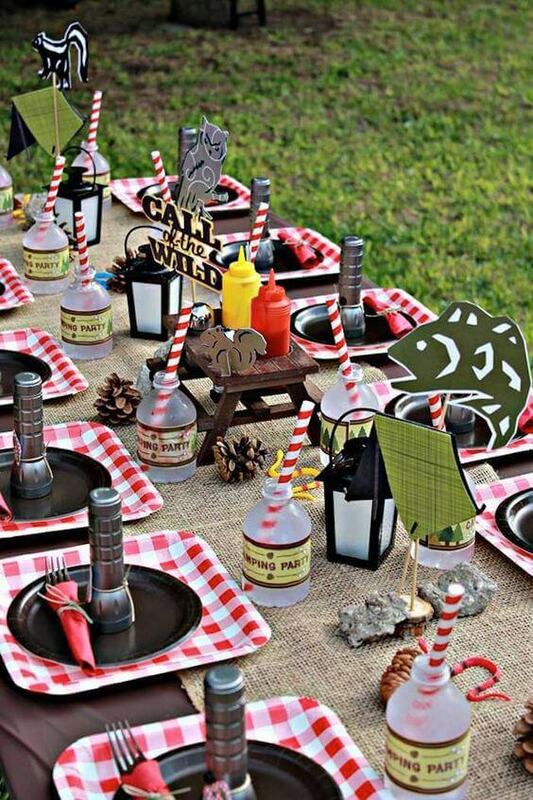 Check out these fishing themed birthday parties as well. Before you take your next trip, check out these camping hacks, too! 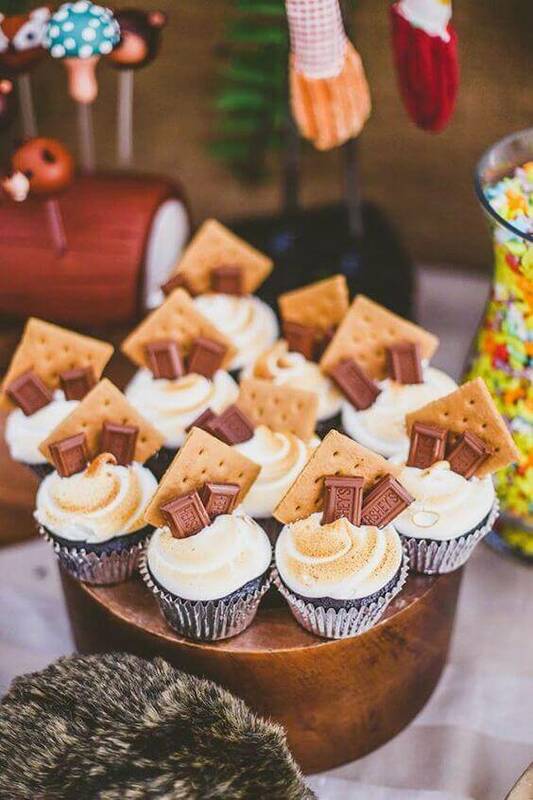 When s’mores and cupcakes collide, you better be ready to run for the dessert table! S’mores are a quintessential part of camping, much like cupcakes and cake are the norm at a birthday party. Serving up s’mores cupcakes at a camping party is a genius idea! These chocolate cupcakes with a toasted marshmallow frosting are topped off with a graham cracker square and chocolate bar! No roasting sticks needed! Kids will especially love the darling animals incorporated into this woodland campfire birthday party. 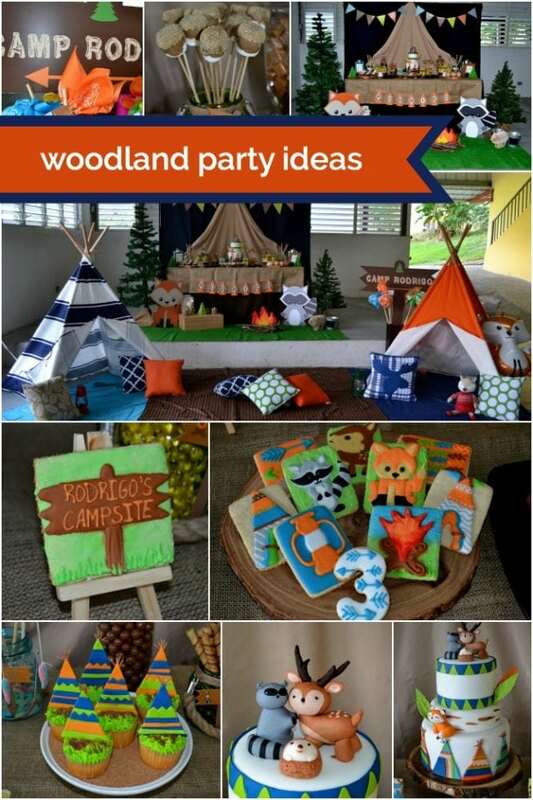 From adorable woodland themed cakes to cute woodland animal party hats, cupcakes, and plush toys, the details in this campfire birthday are breathtaking! 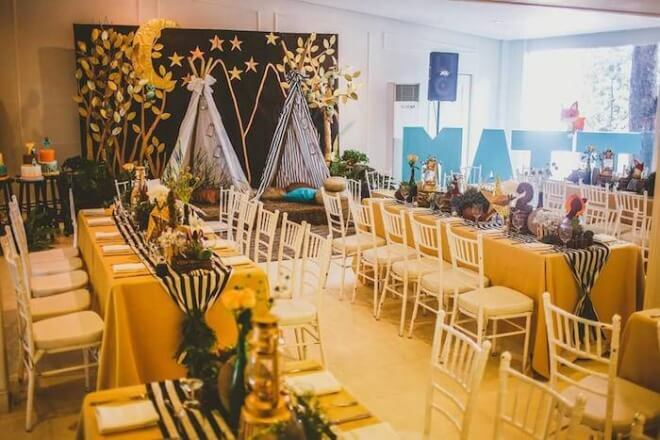 Party guests could camp under the starry night in animal hide blankets and charming teepees. A camping party lends itself to some extra cool party activities. 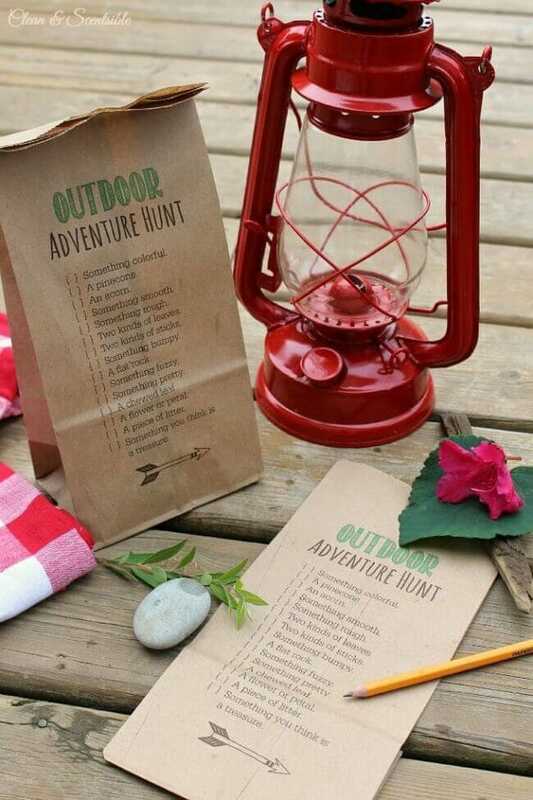 Camping party guests will love this outdoor adventure hunt idea, and you’ll love how easy it is to execute with a printable scavenger hunt list you can print directly on a brown paper sack that in which they can also store all of their hunt items. Examples of items guests must find include: a pinecone, an acorn, a flat rock, a piece of litter and so on. 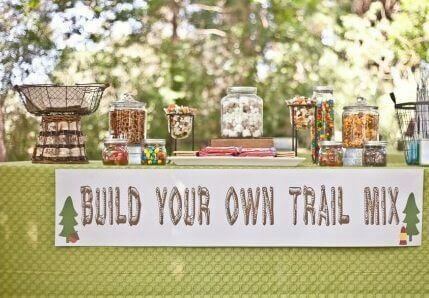 Trail mix, camping and hiking all go hand-in-hand, which makes organizing a build-your-own trail mix bar at a camping party completely genius! Little campers will love creating their own trail mix concoctions. You’ll love how easy it is to put together. 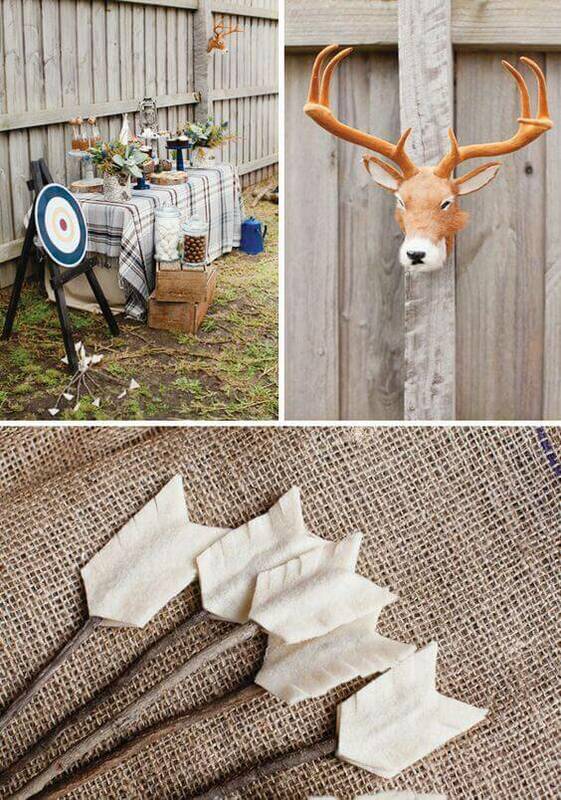 If you’re planning a camping themed boy’s birthday party, check out the rustic, outdoorsy details of this party! From a retro camping park admittance ticket style invitation to creative camping inspired treats and decorations, everyone will want to come hang out at your camping party! The Coleman brand has long been a part of camping trips, but now it is playing a starring role in camping parties too! This Coleman lantern cake is so realistic with amazing fondant detailing. No need to go to great expense for your camping birthday party cake this year. 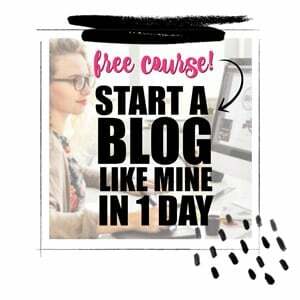 You can DIY your own for a fraction of the cost. Decorate your camp fire cake using chocolate icing. Add rolled chocolate wafer sticks to serve as logs. Top off with shards of red and yellow sugar glass to represent the flames. Serve up this beauty on a rustic round wooden block. Nothing makes a camping themed birthday party more fun than making your own s’mores or filling up your own bag of trail mix. Everything from the printable decorations to the gingham and black place settings will make you want to head to the great outdoors! Trying to come up with inspiration for camping birthday party food? You’ve come to the right place! Stretch your imagination and a little creativity and food labels transform a tin bucket of cheese puffs into “campfire flames” and lemonade into “bug juice”. You’ll find creative uses for berries, and more! 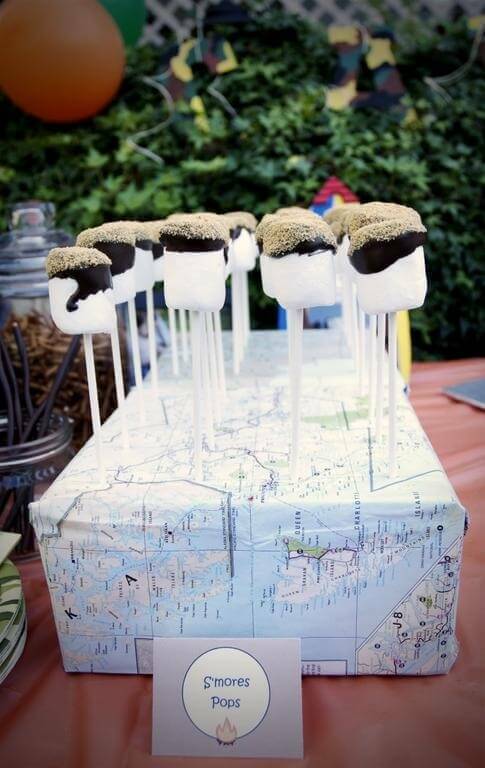 You can skip the hassle of a fire altogether by making these s’mores pops ahead of time for a camping themed birthday. Simply dip a marshmallow in melted chocolate before topping with crushed graham crackers. Serve on a sucker stick. 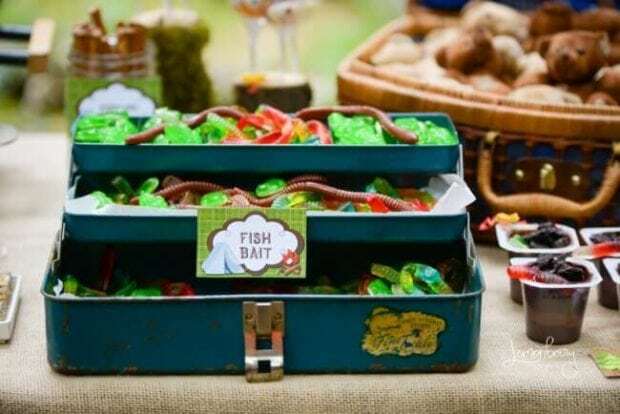 You can recreate the look of this awesome camping party treat idea by sourcing an old fishing tackle box and loading it up with all sorts of gummy worm bait! Party guests will be hooked for sure! Now you can enjoy the beauty of a campfire with no chance of getting burned. 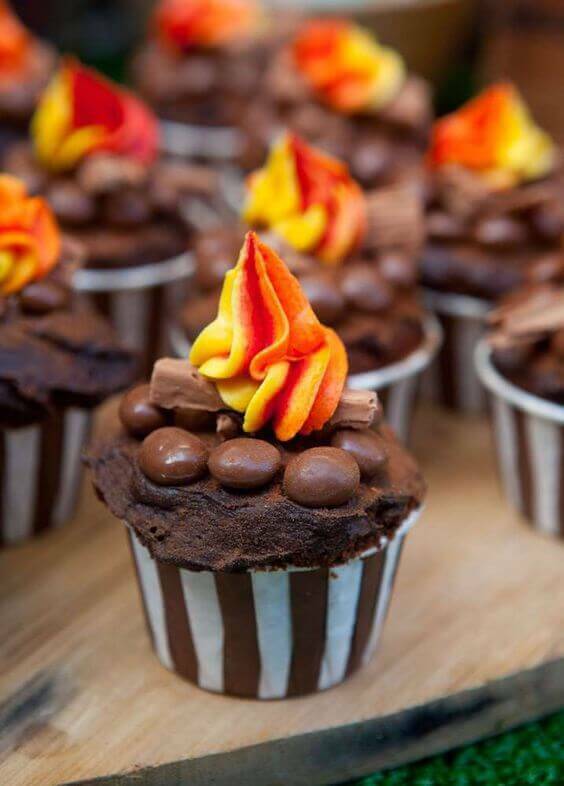 Perfect for a camping party, these campfire cupcakes are topped with candy logs and fire ring with orange and red frosting flames! 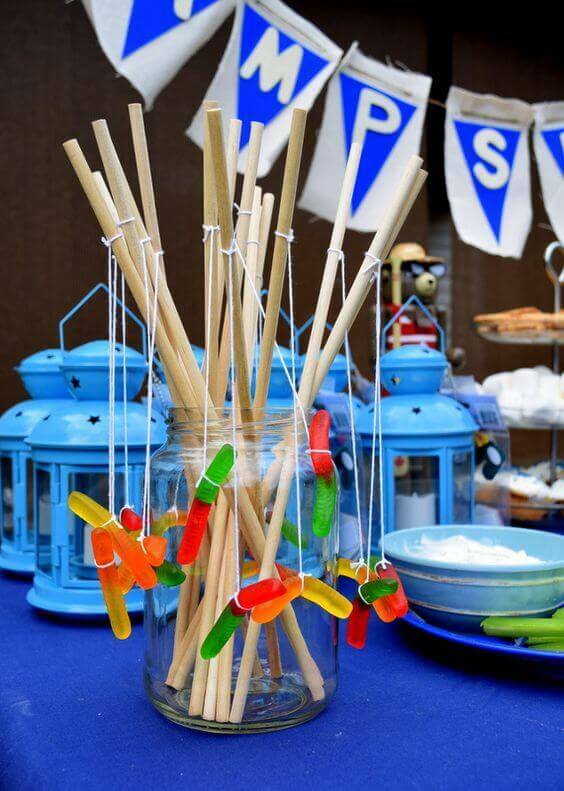 What do you get when you combine thin wooden dowels, string and gummy worms? You get some awesome camping party treats, that’s what! These fishing rod gummy worms will be a hit! Thank guests for making your party s’more fun! 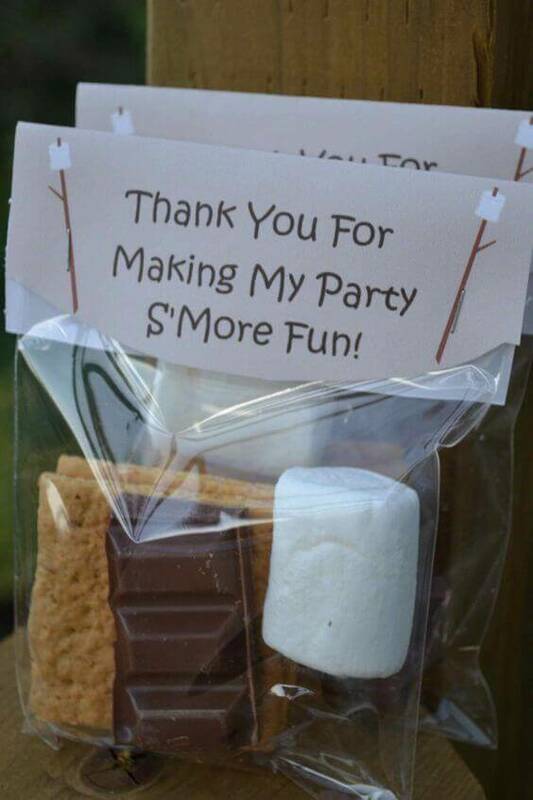 Use cellophane bags and a printable bag topper to put together easy-to-assemble s’more party favors. Include a few graham crackers, a marshmallow or two and some chocolate squares. Nature is your best friend when it comes time to plan decorations for your camping party! 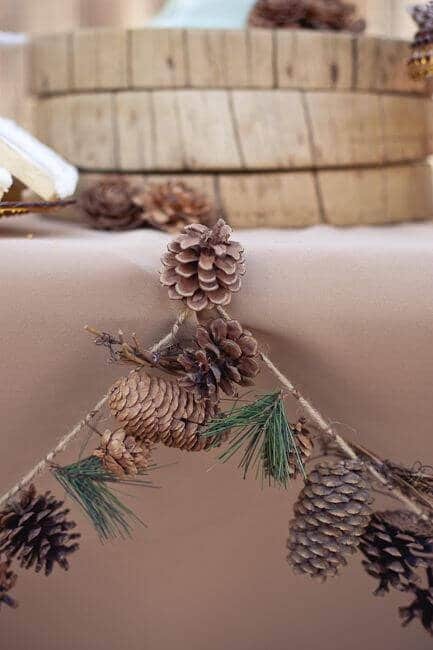 Round up a bunch of pinecones and sprigs of greenery and tie them to twine or jute to create a pinecone garland decoration. Lanterns filled with candy. Mini fishing poles using bamboo poles, vending capsules and edible bait and tackle. 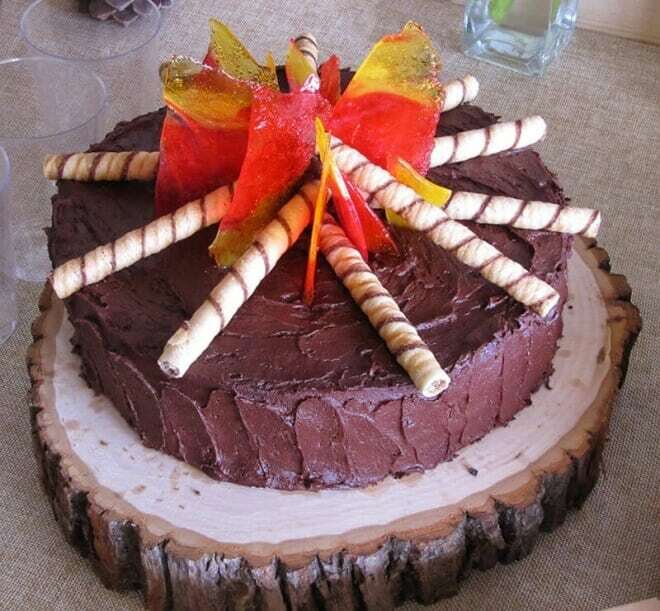 A campfire cake made from chocolate candy logs, rock candy embers and a sugar cookie flame. What do all of these have in common? 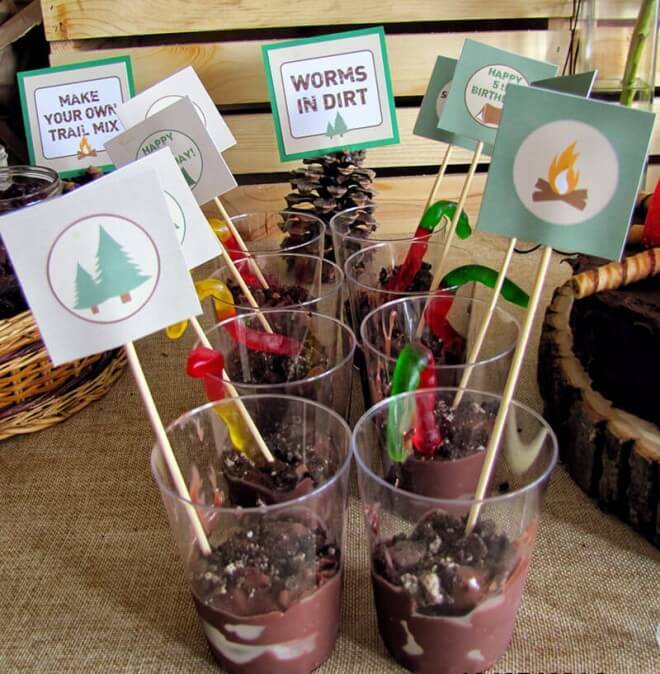 They make for one awesome camping birthday party dessert table! 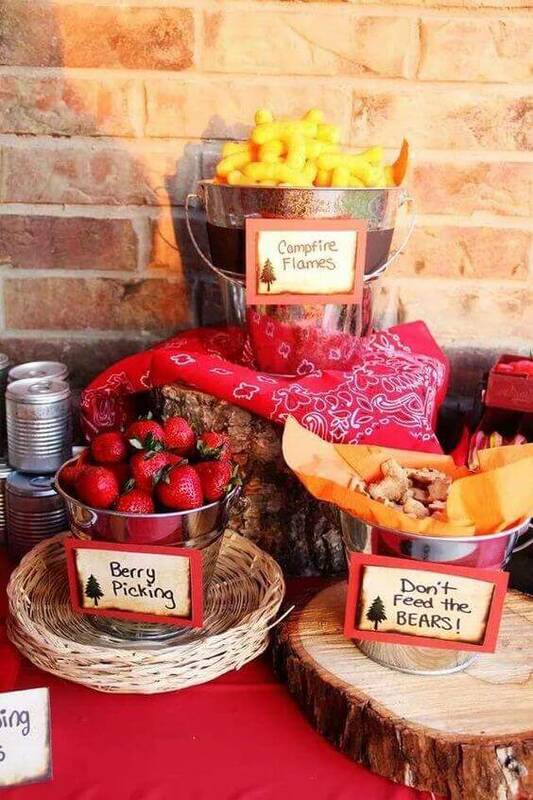 Get creative with your camping party food labels! 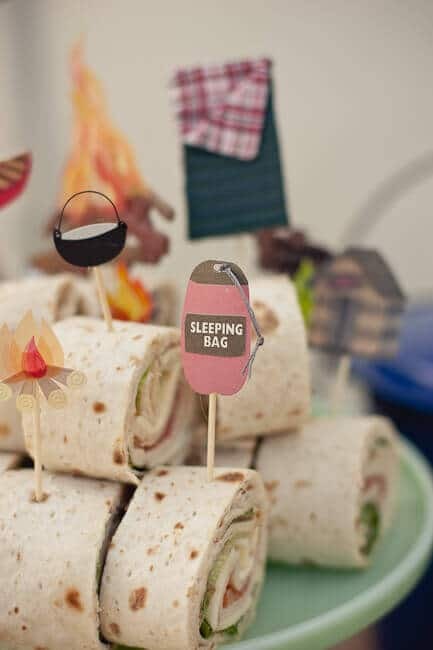 A sleeping bag is a much cooler name for a sandwich roll served at a camping birthday party, and no extra work is required except a printable food label. Don’t spend a small fortune on camping birthday party decorations. Start by raiding your own camping supplies. This camping party is decked out in items like a checkered tablecloth, pie tins, bandanas and a lantern that were already owned. 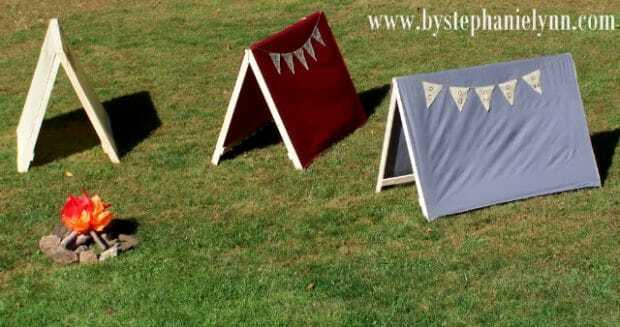 Set the stage for an amazing camping party by DIYing these kid-size play pup tents! Would you believe they are less than $9 to make? That’s inexpensive enough to create several tents for a whole campsite! A camping party without a campfire? That would be tragic! Create a cozy campfire from felt and enjoy a campfire anytime, rain or shine! 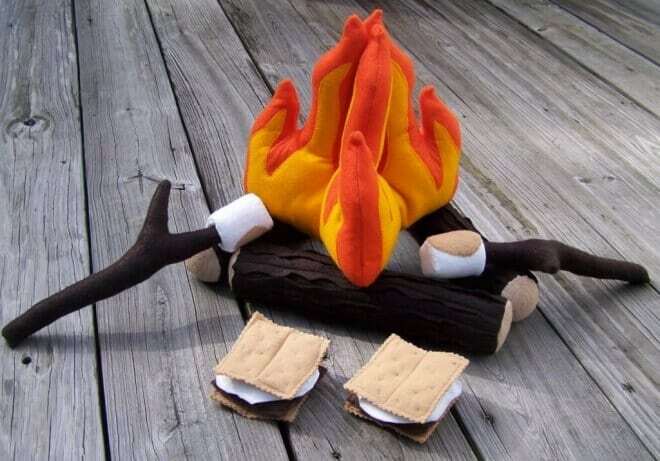 Felt and polyester fiberfill are the main materials used to create this felt campfire set. Hand and machine stitching are needed to complete the project. If you’re planning a backyard winter camping party, you won’t want to miss seeing how flannel, pinecones and wood textures are used in this party to create a wintry look! Plus, check out the adorable bear cake pops, fondant tent topped cake and amazing sugar cookies! Kids might turn their noses up at an invitation to taste test worms in dirt. Once they know it’s really swirled chocolate and vanilla pudding layered in plastic cups topped with chocolate cookie crumb dirt and gummy worms, we’re pretty sure they’ll change their minds. Isn’t this perfect for a camping party? These hobo sacks (bindles) are such a creative camping party favor idea! 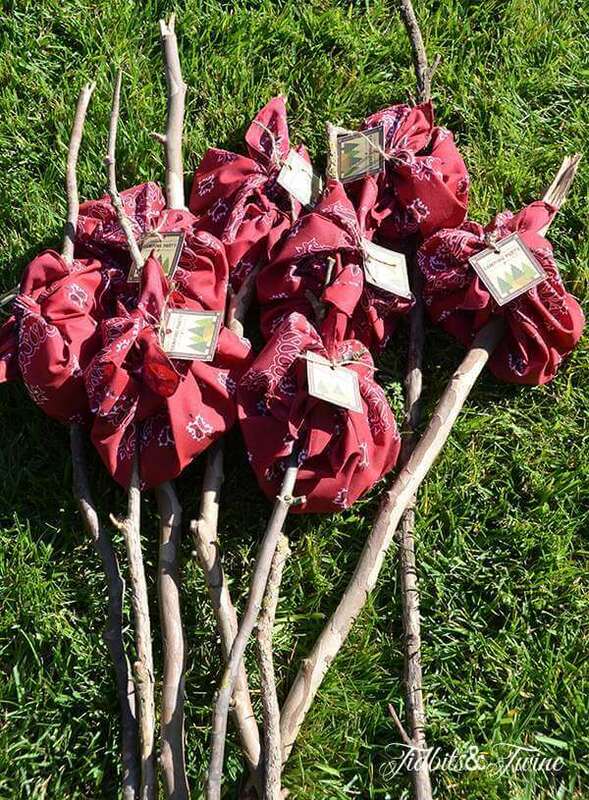 Just tie a bandana on a tree branch/stick and fill with treats like s’mores kits or trail mix. Attach a printable tag with each guest’s name for easy identification of each person’s sack. 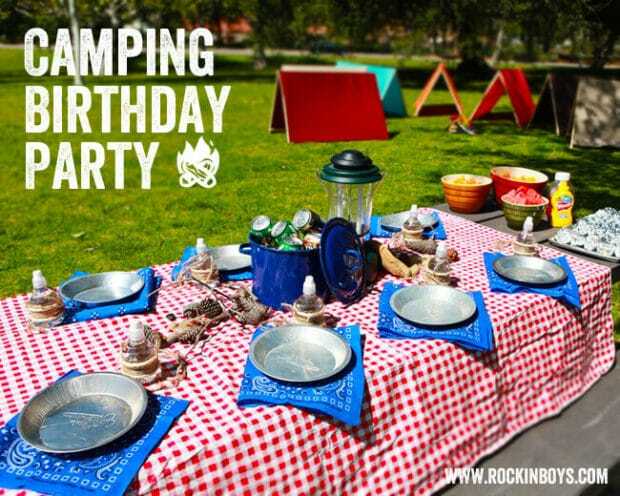 Planning a camping birthday party? 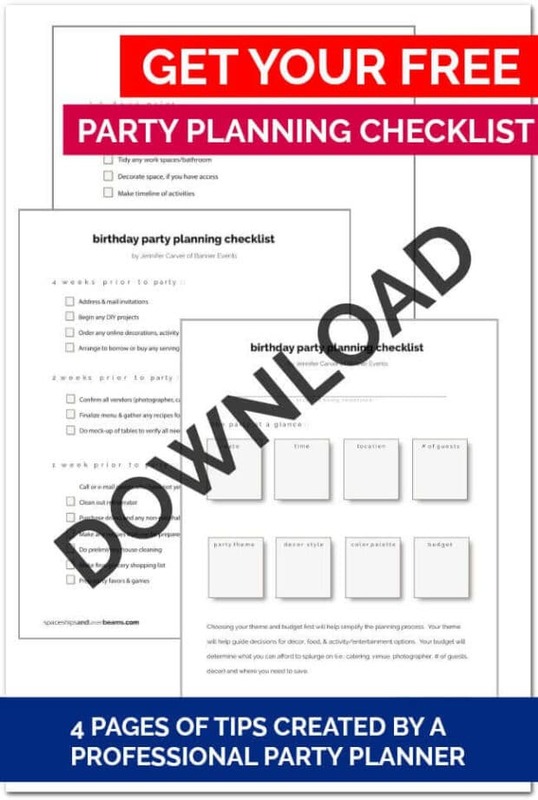 Check out these great party source ideas gathered by the Spaceships and Laser Beams crew. 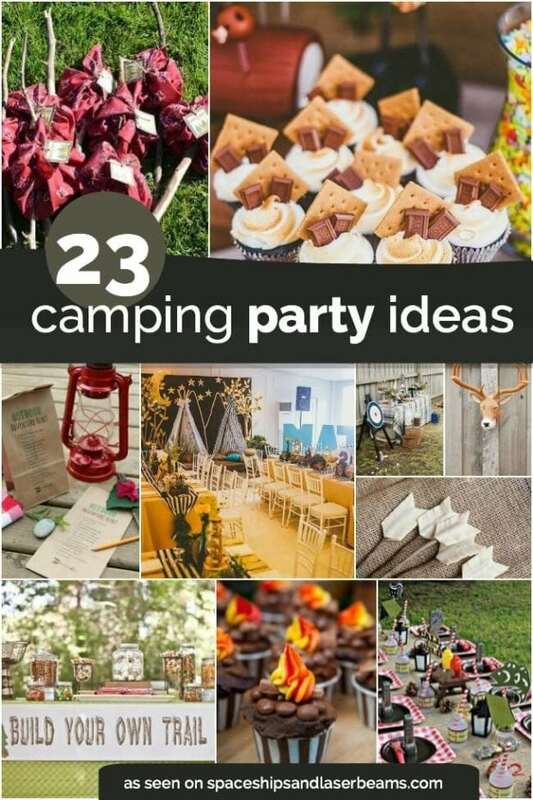 Be sure to check out more camping party ideas.